Human car Written on April 4, 2009, by Ingeborg. A composite frame that resembles human bone structure, with a skin stretched around it that can illuminate. 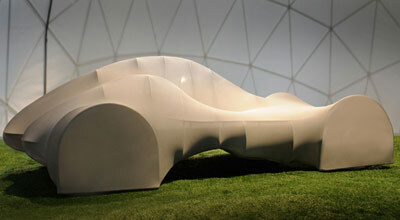 The KG-1 Concept car by KesselsGranger is designed around the human body. The driver sits in an active position, the passenger passive. Headlights are made of a fibre mesh. The high-tech textiles by TenCate can resist any hazard and are light or even lighting. Read more from the Dutch design, Speed category. Stay up to date via RSS , or Trackback from your site.